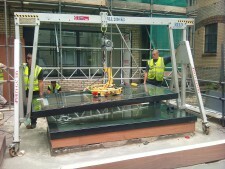 Specialist Lifting Solutions Offer a wide range of glass lifting and handling solutions. Whatever your removal, planning or storage requirements, you can rest assured you are in professional hands with Specialist Lifting Solutions. We provide services such as, collection and delivery of glass, relocation of small and large glass panels, to manual handling of glass. Here at Specialist Lifting Solutions we supply a wide range of glass moving and manual handling solutions. Are team have been trained in the correct Glass machine moving, loading and unloading technology to provide a safe, controlled and efficient way of working. As well as all of our staff being CSCS registered (Construction Skills Certification Scheme) we do not only participate in commercial works we also provide a service for any small domestic works you may have. We hold a diverse range of glass lifting equipment covering the vast majority of glass sizes & weights to for fill your every need. Manual Handling is a major contribution to accident and injuries. This is where Specialist Lifting Solutions Service are a major force in reducing these statistics. We can provide risk assessments method statements and task specific risk assessments for all work carried out. Take a look at our website to see the different items, methods and obstacles we can overcome to reduce any Health and Safety issues. When you request a Contract Lift, SLS Lifting will provide you with a written quotation covering all the planning, management, craneage and our standard insurance (details available on request). 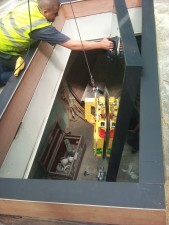 We will then provide a task specific method statement, lift plan, craneage and operators, lifting equipment and an Appointed Person to assume responsibility for the mandatory on-site requirements. Specialist Lifting Solutions welcome any questions or queries of any of our services you may require.